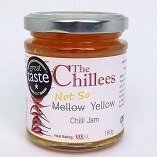 Delicious citrus juicy Aji Lemon Drop Chillies with Ginger and Garlic to give a fresh flavoured, sweet heat. Superb with Cheese and Cold Cuts. Or why not use to add a little heat to your Sunday roast. Add a teaspoon to the juices in the pan when making your gravy. Really brings out the flavour of the meat juices and adds a little heat too. But for the perfect indulgent snack, enjoy on baked camembert with a fresh crusty roll, a pint of cider or beer, or your favourite glass of wine. Ingredients: Sugar, Vinegar, Yellow Peppers, Aji Lemon Chillies (7%),Ginger, Apple Pectin, Garlic.